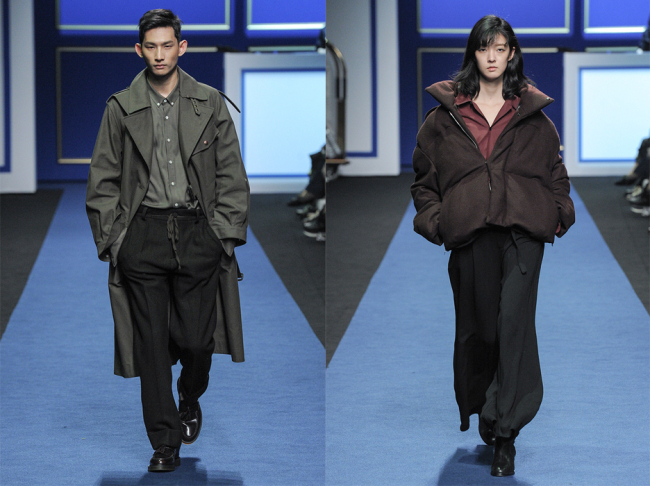 Seoulites struggled to stay comfy in the widely fluctuating temperatures this week, but boxy sweaters, oversized wool coats and chunky winter scarves did not seem at all out of place on the runways of Seoul Fashion Week. With the weather unexpectedly turning chilly this week, cozy, warm winter fashion seemed the right choice for SFW visitors who showed up lightly dressed. Here are some highlights from the first two days of the SFW which ends Saturday. Designer Nam Noah of Nohant, known for T-shirts featuring Korean and English letters he designed with actor Yoo Ah-in, made his debut at SFW on Tuesday. Inspired by the relaxed atmosphere at a hotel he stayed at while on vacation in France, the designer presented relaxed and comfortable silhouettes. Using monotone colors such as brown, khaki and black, he created chic loungewear such as loose-fit long knit cardigans, lounge pants, turtleneck sweaters and bathrobe-inspired overcoats. Yoo – who sat in the front row at his friend’s first show -- moved to the funky, upbeat live DJ music that played as background music to the collection, while applauding a number of pieces, including a woman’s oversized padded jumper in dark brown, paired with relaxed black pants. Classic menswear pieces -- including a double-breasted suit and a trench coat -- met comfort at Ordinary People’s fall-winter 2016 collection on Tuesday. 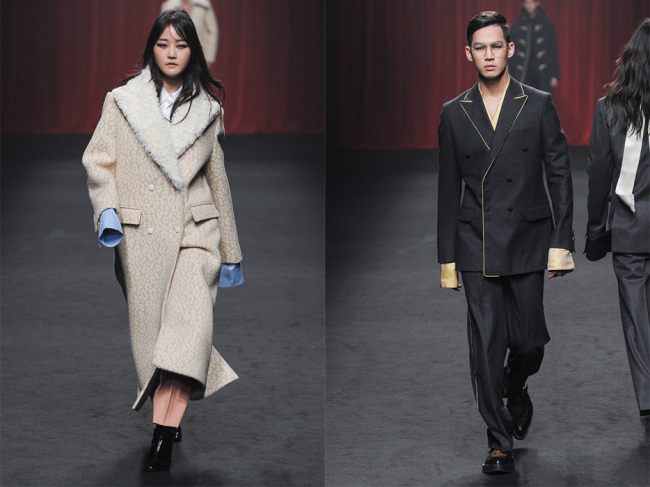 Designer Jang Hyeong-chul presented classic menswear pieces that had been reinterpreted with relaxed silhouettes of bathrobes and pajamas. 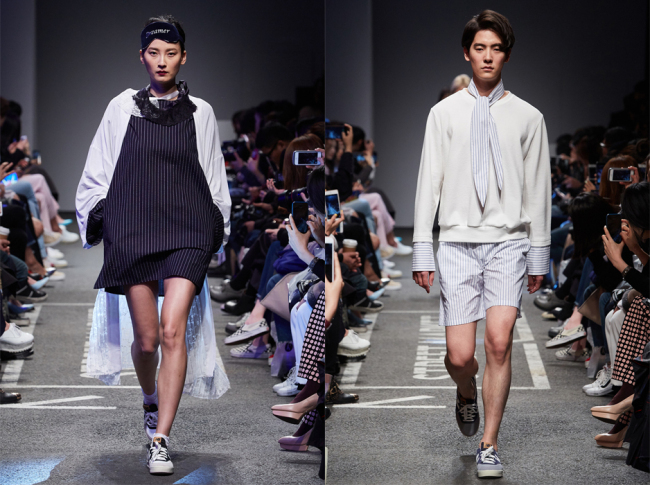 Jang shared Nohant’s theme – the relaxed atmosphere of a hotel -- but his creations featured classic menswear tailoring. Celebrity model Kang Seung-hyun opened the runway with an animal-print long wool coat in soft beige. She was one of the few female models who presented six womenswear designs at the mainly menswear show. The double-breasted suits had relaxed silhouettes with features reminiscent of silk striped pajamas. A belted trench coat design was effortlessly wrapped around like a bathrobe. Contemporary brand Studio K’s collection, presented Tuesday evening at the hip Common Ground shopping mall in southern Seoul, brought together dreams and reality in a collection of modern office wear with a rebellious twist. 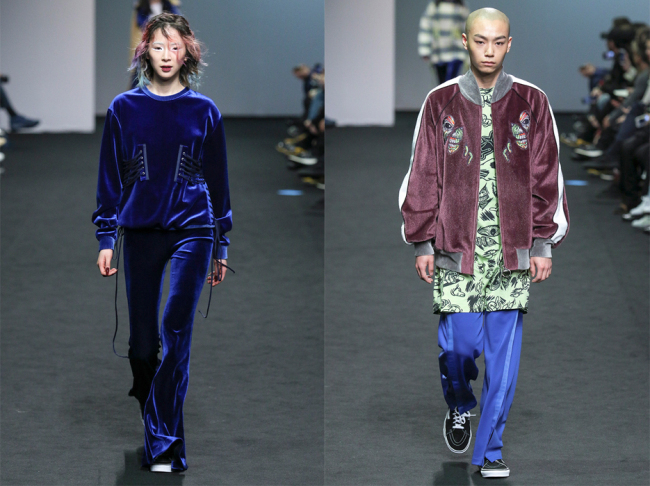 Designer Hong Hye-jin wanted to highlight the contrast and coexistence of dreamers and realists, according to a press statement. Cotton, silk and wool, representing the cool-headed realist, were matched with suede and corduroy. Models sported sleep masks engraved with the word “dreamer” in a nod to starry-eyed idealists who chase dreams in the daytime. Whimsical accessories, such as lace necklaces and cheeky blue hairpins, accompanied the more formal pinstriped pants and skirts, making for a prim yet saucy collection. Designer Kathleeen Hanhee Kye, staying true to her established style of funky, high-end streetwear, began her show on Tuesday afternoon with a rich, cobalt blue ensemble. Following this opening were more of the designer’s staple velvet pullovers -- this season adorned at the sides with fringe ribbing – along with silk-printed shorts and mini dresses. The color palette featured deeper shades such as maroon and olive for the fall season. Patterns of Eddie the Head, the skull-faced mascot for the heavy metal band Iron Maiden, were repeated as a parody of the “zombie spirit,” according to Kye. “I think zombies are a metaphor for people these days lacking in human fundamentals and only filled with desire and instinct,” the celebrity designer said in a statement.